Quest For Adventure: Seabourn Quest anchored within sight of the González Videla Base, a Chilean Research Station on the Antarctic mainland’s Waterboat Point in Paradise Bay. 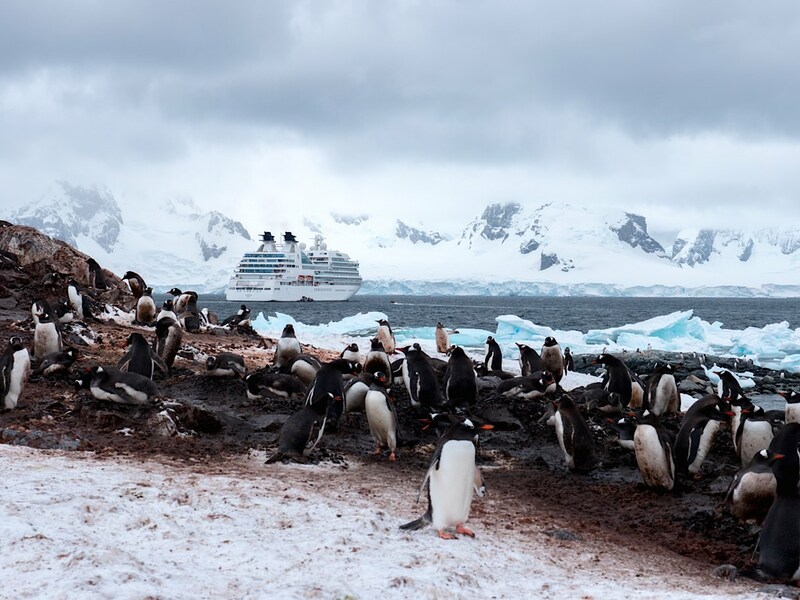 © 2014 Avid Travel Media Inc.
My photographs of Antarctica are about to come to a close. This week marks my last few photos in the series, Antarctica Explored, A Photo A Day. I snapped this photo at the González Videla Base, a Chilean Research Station on the Antarctic mainland’s Waterboat Point in Paradise Bay. The penguins look like little old men, Charlie Chaplinesque, waddling along in their black-and-white tailed tuxedoes. The more you watch them the more you become aware that these funny creatures appear to have human qualities. They reflect us in some way, though I am not sure I can put my finger on how they do so. I hear they are quite graceful underwater. Not so on land. Who would be waddling through snow and ice covered with penguin guano? They waddle along, falling now and then on their faces, with no arms to break the fall. They get right back up and continue their journeys. You’d be surprised at how long you could watch penguins. Last night at a dinner party a woman asked me, What’s your favorite place in the world for a cruise? She expected me to say someplace in the Mediterranean perhaps, but I replied, Antarctica. Why, she asked. “There’s nothing but snow and ice down there,” she added. And penguins, I retorted. Oh yeah, she said, smiling and suddenly realizing why Antarctica might be so appealing. Even if Antarctica were only snow and ice, the White Continent would still rank among my favorites. I wrote last week about its vast stillness in Humbled By Grandeur, Gigantic Glaciers. There’s also the 50 Shades Of Blue, Icebergs and ‘My Brown-Eyed Seal’: Antarctica Explored. Then there are the penguins. They bring smiles. In fact, I posted a short video called Penguins To Make You Smile to share with my friends back home and readers of avidcruiser.com. I really think I could watch them forever. I was lucky to watch them for about a week during each of the six days that we were exploring the beautiful White Continent on Seabourn Quest.